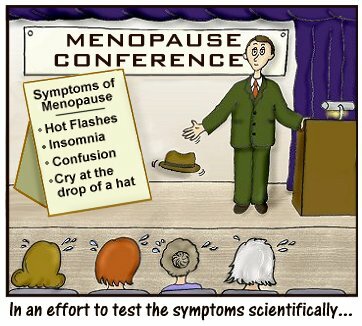 The menopausal woman doesn't intend for her emotions to cause turmoil, but they do. She may cry over the slightest thing which never would have affected her before, or she may just feel "down" for no reason at all. Buckets of tears may pour out over concerns that earlier would have solicited only a sigh. Although chronic dry eye occurs in both men and women, it affects women two-to-three times more often and is most common in post-menopausal women because of the hormonal changes associated with aging. Although it is more commonly thought of as “the libido hormone,” testosterone plays a critical role in maintaining the tear-making lacrimal gland. As women grow older, their production of testosterone declines leaving the ocular surface susceptible to inflammation. Once the lacrimal gland is inflamed, it may reduce tear production. Anyone who suspects they may have chronic dry eye should visit an eye doctor, who can make a diagnosis and determine the proper treatment regimen. While there are eye drops that provide temporary symptomatic relief, there are also prescription therapies available to address this condition. Eye doctors can determine the best therapy for each individual patient.